This page is dedicated to Hunting reports and photos of our dogs in the field. This Club is predominately made up of hunters working hard to train their dogs to be the best companions in the field. We all enjoyed hunting so we got a dog. The Hunt Tests and Field Trials give us a chance to add to the enjoyment we get when we are in the field with our 4 legged companions. As we continued to train to the highest level of our expectations, we have learned more about dogs and how to handle them. It has been a great journey. The woodcock hunting season was nice this past Fall. Several club members were known to have been chasing the little russet birds throughout the season and having some success. There is nothing like chasing those timberdoodles with a spaniel! I have received reports of other club members having fun in a duck blind and pheasant fields. 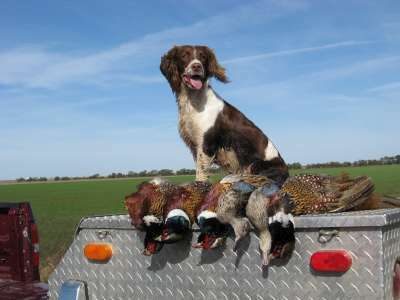 Some members even gave reports of shooting doves in September and giving their spaniels some retrieves. There have been several spaniels getting to work at some area game farms picking up Pheasants from some European Style pheasant shoots. This is great work for the spaniels getting to make retrieves but also getting to work on their patience waiting on birds to be shot. This is Bingo with a limit of pheasants and a couple bonus blue-wing teal taken on a Youth Bird hunt in Kansas a few years ago. Josie with a limit of Woodcock taken in Missouri.